Associated Anesthesiologists, P.C. » McIntire, Nathan R., M.D. Home / McIntire, Nathan R., M.D. 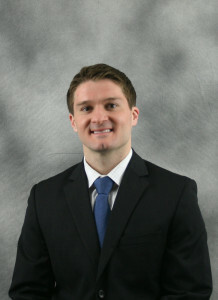 / Employees / Anesthesiologists / McIntire, Nathan R., M.D. Nathan R. McIntire, M.D. is a native of Elkhorn Nebraska. Dr. McIntire completed his pre-medical degree at the University of Nebraska in 2005 with a BS in Biological Studies. He then completed medical school at the University of Nebraska Medical Center in 2010. Dr. McIntire completed an internship in Internal Medicine at the University of Nebraska Medical Center in 2011. He then completed an anesthesia residency at the University of Nebraska Medical Center in 2014. Dr. McIntire furthered his education by completing a Fellowship in Cardiac Anesthesia at the University of Nebraska Medical Center in 2015. Dr. McIntire is married and has 1 son and one daughter. His personal interests include enjoying the University of Nebraska athletic programs, outdoor activities and spending time with his family. Dr. McIntire is Board Certified by the American Board of Anesthesiologist and has been with Associated Anesthesiologists, P.C. since July 2015.